It’s tough to argue that Ridge Racer isn’t in the middle of a slow, possibly permanent slide into irrelevance. 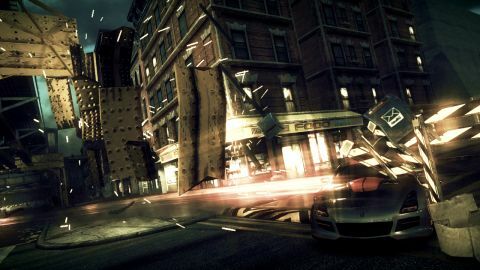 It's having a hard time finding its footing in a genre dominated by realistic sims like Gran Turismo and Forza, and where even the most arcade-y new games enjoy some combination of sophisticated physics, detailed damage modeling, and wanton carnage. So it’s easy to see where Namco’s coming from with Ridge Racer Unbounded - this is its attempt to make Ridge Racer relevant again. Your hunting ground is the city of Shatter Bay, apparently named by the same folks who brought us products like Axe Body Detailer. It’s split into nine districts, each of which offers seven underground racing events. You only need to place third in any given event to proceed, but place first in all seven and you’ll “dominate” the district, which may or may not involve peeing on the fire hydrants. This is all tied together with a hilariously perfunctory fiction about an underclass uprising by...recklessly racing cars? Something like that. Rest assured that you’ll never hear of this silliness after the intro. That’s just as well, because it lets you focus on what actually matters: the racing. Bugbear is an old hand at this, which is immediately evidenced by the weighty feel of the driving physics and the aggressive, intelligent-feeling AI opponents. Unbounded successfully sells the illusion that you’re piloting several thousand pounds of metal and plastic at 150 mph, and the collisions - be it with walls or other cars - feel nearly as meaty as those in FlatOut and Burnout. Of particular note is the sensitive, slightly odd-feeling handbrake, which facilitates the corner-spanning drifts for which Ridge Racer used to be famous. The feel here is completely different, to the point that we spent our first couple hours just trying to get a handle on how to successfully drift in Unbounded’s strange new world of physics. Once we got the idea it was fine, but the learning curve may be substantial if you come in expecting typical Ridge Racer physics.